List the volunteer opportunity name, associate it to an event and then describe the opportunity. Add as many time slots needed for a particular opportunity and the number of volunteers required. Add volunteer opportunities to your website quickly and easily. Volunteers can then review and sign up for designated time slots. If an organization relies on volunteers to get a lot of work done, they typically have little or no paid staff. The Volunteer Opportunities Manager makes it easy to post volunteer opportunities on their website. This tool works in conjunction with the Events and Classes Editor. 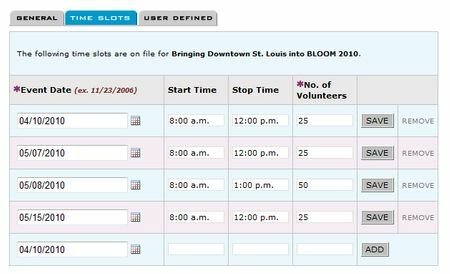 The event is created with that tool and if volunteers are needed, the volunteer opportunity (description, day(s) and time(s)) is profiled with the volunteer tool. You must be logged in as a Master Gardener, to view volunteer opportunities. Please contact us for an online demonstration of this cool technology.